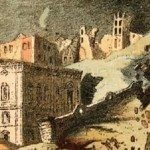 One of Europe’s most elegant capital cities was laid waste at a stroke when a ferocious earthquake – thought to have measured as high as 9.0 on the Richter scale – hit Lisbon in 1755. It was the morning of November 1, All Saints’ Day, and thousands of citizens were attending Mass in the city’s churches. Contemporary accounts described animals becoming unusually agitated in the hours preceding the disaster and water in the wells developing a strange taste. The epicentre of the earthquake was out in the Atlantic, some 200 km (125 mi) to the southwest of Portugal. When it struck Lisbon, the ground shook violently for ten terrifying minutes and vibrations were felt throughout the whole Iberian Peninsula. Hundreds died when the quaysides on which they had gathered collapsed as they were trying to make their escape on the River Tagus. Worse was to follow, however. Fires broke out throughout the city; when they finally abated five days later, 85 per cent of Lisbon’s buildings had been destroyed, including the cathedral, the royal palace and the new opera house. The earthquake also generated a huge tsunami which inundated the city and devastated the coastlines of Portugal, Spain and North Africa. Reaching a height of 15 m (49 ft), the giant wave had an effect which was noticed as far away as the West Indies. The Lisbon earthquake sent shockwaves throughout Europe; literally, with waves noted on the surface of Loch Ness in Scotland, but also metaphorically in the worlds of thought and letters. Many intellectuals began to question the notion of divine providence and the view that such natural disasters were part of God’s plan for the world. The most famous product of this new spirit of scepticism was Voltaire’s satirical masterpiece Candide. What was Lisbon’s earthquake death toll: 80,000-90,000 of Lisbon’s inhabitants. One third of the city’s population is thought to have perished and the overall death toll from the earthquake, fire and tsunami was probably well in excess of 100,000. You should know: The Lisbon earthquake continues to puzzle seismologists and confound plate tectonics theory as the city lies nowhere near a plate boundary.